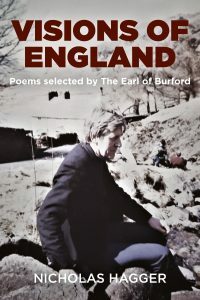 In 1999, while working as his Literary Secretary, the Earl of Burford, a descendant of the 3rd Earl of Southampton (Shakespeare’s patron) and of the 17th Earl of Oxford and Charles II and heir to the Dukedom of St Albans, made a selection of Nicholas Hagger’s poems that celebrates places in England, conveys his mystical awareness of the unity of the universe and places him in the visionary tradition of William Blake, the poet of ‘Jerusalem’ and “England’s green and pleasant land”. Soon after Visions of England was completed the Earl of Burford came to international attention when he leapt onto the Woolsack of the House of Lords in a principled protest against the Blair Government’s plan to abolish hereditary peers’ voting rights, which led to 92 remaining in the Lords. A few months later he left Nicholas Hagger’s employ and the selection was buried under papers for nearly 20 years. In 2018 Nicholas Hagger came across Visions of England while preparing papers to send to his archive. It now seemed as if the selection had been made with Brexit in mind. The places are full of English history and culture, and the poems are prophetic in their anticipation of England’s new spirit of independence. These poems convey Englishness with a freshness and vividness that startle. The Earl of Burford is a prominent lecturer and biographer, and his selection is noteworthy for the metaphysical perspective he brings out in Nicholas Hagger’s profound poems whose traditional qualities constantly surprise and delight. NICHOLAS HAGGER is a poet, man of letters, cultural historian and philosopher. He has lectured at universities in Iraq, Libya and Japan, where he was a Professor of English Literature, and has written 49 books. These include a substantial literary output of 2,000 poems (with over 300 classical odes), two poetic epics, five verse plays and 1,200 short stories; two travelogues; and innovatory works on literature, history, philosophy and international politics. His archive of papers and manuscripts is held as a Special Collection in the Albert Sloman Library at the University of Essex. In 2016 he was awarded the Gusi Peace Prize for Literature.